The Rockefeller University’s proposal to build a two-story, 160,000 square foot building over the FDR Drive adjacent to its campus passed an important milestone today with the City Council’s vote to approve the plan. The project now awaits final approval by the mayor following a five-day review period. The building, first envisioned over two years ago and known as the River Building, will house bioscience laboratories, and will serve as a replacement for existing lab facilities that are reaching the end of their operational life and are no longer suitable for modern science. “This new laboratory building is critical to the university’s ability to attract top scientific talent and to sustain our mission of conducting cutting-edge biomedical research, and I am pleased that the project has been embraced by the community and the city,” says Marc Tessier-Lavigne, Rockefeller’s president. “By shifting labs into the newer spaces, we not only provide our scientists with the infrastructure they need to conduct their best work, but also free up space that can be repurposed to consolidate administrative functions that are currently dispersed or located in temporary offices.” The university intends to maintain its current size of approximately 75 laboratories working in areas such as neuroscience, genomics, immunology, structural biology and biophysics. Designed by Rafael Viñoly Architects, the building would extend three-and-a-half city blocks, from between 64th and 65th Streets to 68th Street, and would be large enough to accommodate about 26 labs and 440 scientists. It would be constructed largely below the existing grade, and would feature a landscaped green roof with two glass pavilions, one for offices and a second to house a cafeteria. Viewed from the west, the building would conform to the existing contours of the campus and would be invisible from the rest of the neighborhood. 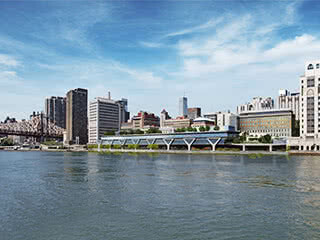 As part of the project, the university will make repairs and improvements worth $8 million to the portion of the East River Esplanade adjacent to its campus. A popular walking, running and biking path located between the FDR Drive and the East River, the East River Esplanade is one of just a few open green spaces on the densely populated Upper East Side. Rockefeller will also establish a $1 million endowment to maintain this section of the esplanade in perpetuity and will make a $150,000 contribution to Friends of the East River Esplanade, a conservancy devoted to encouraging the restoration and renovation of the full length of the esplanade from 60th to 120th Streets. It will also increase by 20 percent its public programming, giving members of the community better access to scientific, artistic and cultural events taking place on the campus. Although the project makes use of air rights over the FDR that the university acquired in 1973, because of its location and complexity it required approval from several city agencies, including the City Planning Commission, the Department of Transportation, the Department of Environmental Protection and the Department of Parks and Recreation. It was also required to go through the city’s Uniform Land Use Review Procedure (ULURP), which takes it before the Community Board and the City Council. From a scientific perspective, one of the key features of the building is its length, which makes it possible to site multiple laboratories adjacent to one another, helping to stimulate scientific interaction. Currently, many university laboratories are located in towers, which can house just one to three labs per floor. Throughout the development process, the university has worked to reach out to its neighbors for help in planning and designing the community improvements associated with the project. New amenities on the esplanade will include improved landscaping, abundant seating, a designated bike lane and a noise barrier along the FDR Drive that will reduce traffic sound by several decibels.